Judge Don Willett, on right, being sworn in as U.S. 5th Circuit Court appeallate judge. Some state leaders in the new year are saying, “Out with the old and in with the new” — at least as far as Texas’ judicial bench is concerned. In December, the U.S. Senate confirmed Willett's nomination to become a new judge for the 5th Circuit Court of Appeals. Standing in front of friends and family, Willett was sworn in as a federal appellate judge. 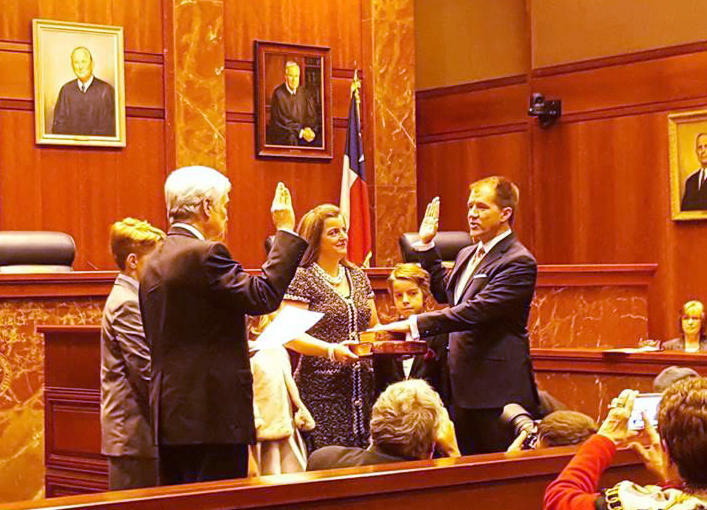 Willett’s swearing in was followed by the swearing in of his successor, Jimmy Blacklock, who was appointed by Abbott after previously serving as the governor’s chief legal counsel. Willett started his legal career as an intern clerking for the 5th Circuit Court. He also served 12 years on the Texas Supreme Court before he and former Texas Solicitor General James Ho were nominated to the federal position by President Trump.